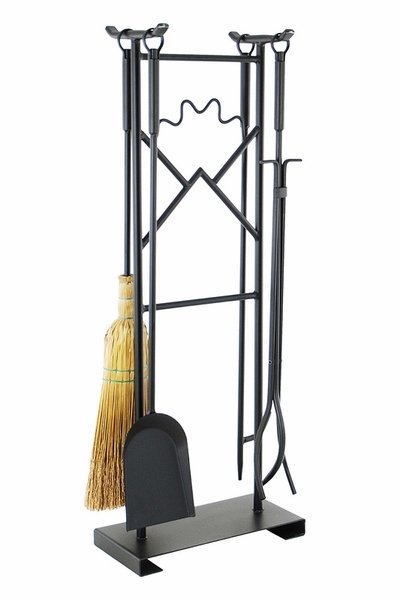 The Minuteman Sunrise Fireplace Tool Set is a useful but decorative wood-burning accessory. The wrought iron stand has a design intended to resemble a rising sun, yet it is abstract enough to fit with many decorating themes. The fireplace tools have a circular loop at the end of each handle, which then hooks over the bars at the top of the stand. The tools are also constructed from wrought iron and include a broom, a shovel, tongs, and a poker. A black powder coating has been applied to the entire set. A matching fireplace screen is also offered for purchase.